Leonardo da Vinci's "Lady with an Ermine" Embarks on an unprecedented European tour on the occasion of the Polish Presidency of the European Union. After the "Golden Era of the Polish Republic - Treasures and Art Collections" exhibition in Madrid, which closes on the 4th of September, the painting will go on display in Berlin's Gemaeldegalerie in August for an exhibition devoted to Renaissance Portrait Painting. 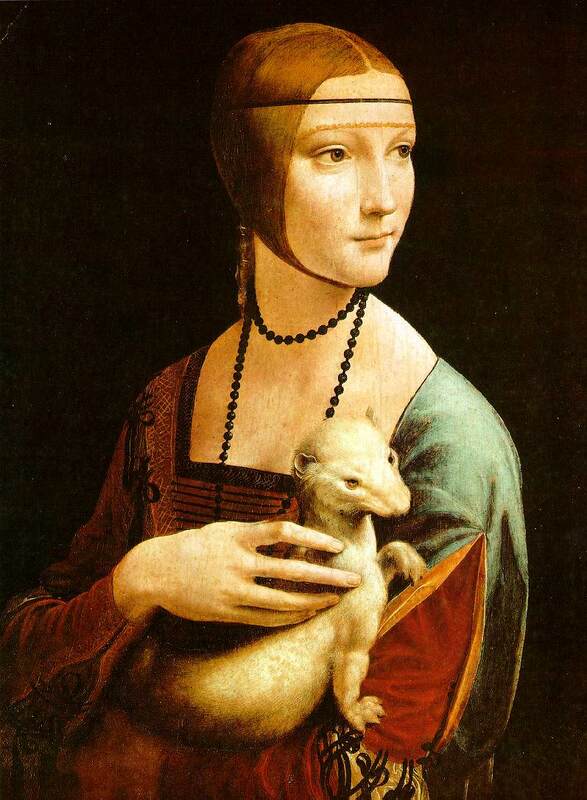 Leonardo da Vinci, "Lady with an Ermine"
Poland's Ministry of Culture announced its decision to loan the painting, currently in the collection of the Czartoryski Museum in Kraków, for a tour of Europe over the course of the Polish Presidency of the EU Council. After the Golden Age of the Polish Republic - Treasures and Art Collections exhibition in Madrid, which closes on the 4th of September, the painting will go on display in Berlin's Gemaeldegalerie in August for an exhibition devoted to Renaissance Portrait Painting. In November, it will be displayed at the National Gallery in London as part of the "Leonardo da Vinci: Painter at the Court of Milan" exhibition devoted to the painter's most well-know works and rarer Florentine paintings. Golden Age of the Polish Republic presents over 200 works of art in Polish collections, reflecting the nation's art history from the end of the Middle Ages through the period of partition. "Lady with an Ermine" is the most valuable exhibit at this exhibition. The work was painted by Leonardo da Vinci near the end of the fifteenth century. It is one of only four portraits painted by the man behind the "Mona Lisa". The model for the painting bears a strong resemblance to the model in da Vinci's "La belle ferronnière", currently in the collection of the Louvre. The painting was acquired in Italy by Prince Adam Jerzy Czartoryski in 1798 and incorporated into the Czartoryski family collection in 1800. The painting travelled extensively in the nineteenth century, escaping plunder during the Russian invasions of 1830 thanks to hiding in Dresden and Paris. During the Nazi occupation of Poland, it was appropriated by the Kaiser Friedrich Museum in Berlin. In 1940 it returned to Kraków at the behest of Governor Hans Frank, who wished it to hang in his office. At the end of the war, it made its way back to Poland from Frank's house in Bavaria and has been on display at the Czartoryski Museum in Kraków ever since. Loans of the painting have been banned as it was feared transport would harm the work. The unprecedented decision to loan the painting was announced in spring 2011 by the General Conservator Piotr Żuchowski, founder of the Princes Czartoryski Foundation Adam Karol Czartoryski, director of the National Museum in Kraków Zofia Gołubiew and the Conservator of the Małopolski Voivodship Jan Janczykowski. The work is currently held by the Royal Castle in Warsaw, although the National Museum in Kraków has been requesting its return to the museum. However, once it returns to Poland in February 2012, it will not be released for ten years (unless there are extenuating circumstances). It will instead serve as the subject of a research project on its origins. Who is the Lady with an Ermine? We knew today that the portrayed lady is Cecilia Gallerani, mistress of Duke Ludovico Sforza, also known as Il Moro. Leonardo was a painter at his court when the portrait was made. The rodent's Italian name, ermelino, might have been an allusion to the insignia of Milan's ruler; the Greek name of the animal, gale, can on the other hand be found in the duke's mistress's surname. Leonardo used a similar allusion in his portrait of Ginevra de Benci to, using juniper sprigs, ginepro in Italian, which stick out from behind Ginevra's head. This form of coded message is linked to the context in which Leonardo was painting the portrait. At the same time negotiations were held to marry Ludovico with Beatrice d'Este. The painter could not show the lovers embraced. Thus the animal lying on the model's bosom is an oblique depiction of the situation. Still another interpretation, which does not exclude others, suggests that the ermine shown on the woman's bosom is supposed to indicate pregnancy. Given the symbolism of the weasel in Italian culture as well as the fact that Gallerani gave birth to the duke's son in 1541, this explanation seems to make sense. Nonetheless, sophisticated symbolic interpretations fail to solve the puzzle experts from a field quite different have been having with the Lady, or her animal: zoologists claim that the rodent held by Cecilia is neither an ermine nor a weasel. Cecilia gave the Duke two descendants. After his marriage she kept out of the limelight, enjoying the fame of a woman not only beautiful but wise. It is most likely that Cecilia, later Signora Bergamini, kept the portrait until her death in 1536. After that, for the next 250 years the fate of the painting was unknown. The fact that it was the only master's painting which did not influence other painters and that sources from the time keep silent about it suggest the painting must have been kept in a private and inaccessible collection. The portrait's story came alive again around 1800 when Adam Jerzy Czartoryski bought the work in an unidentified town in North Italy. What you cannot see in the painting may be just as intriguing as its title. The missing background must have been visible in the original version of the work. Today the black backdrop is the effect of an alteration made by Countess Izabela, the mother of Adam Jerzy, who got the painting as a gift. The black, dull background was probably added after the painting had been damaged. Most likely there was crack in the upper left corner which was thickly and clumsily glued together. (Still earlier, the Countess wrote "LA BELLE FERRONIÈRE LEONARD D’AWINCI" in the same spot. The inscription mistakenly associated Cecilia with another woman painted by Leonardo.) The black backdrop was supposed to give the painting a "primitive", archaic and mysterious look. The question what is to be found under the black paint in the "Portraitof Cecilia Gallerani" has been asked repeatedly. According to a hypothesis formulated in the 1950s, what is hiding on the right side is a window. Contemporary researchers, such as the American conservator David Bull, suggest that the original background was probably greyish-blue and subtly modelled. The light in the painting falls from the right, in the direction the lady is turning her head. The original background was lighter in that space; it gradually darkened behind the woman's back. Black paint used to repaint the portrait not only destroyed the woman's delicate silhouette, it also froze Cecilia's and her animal's curious gazes which were once turning toward the light. Some clues as to what the background might have looked like can be found in another painting by Leonardo, the aforementioned "Portrait of Ginevra de Benci" which can be found in the collection of the National Gallery of Art in Washington. The exhibition has been cofinanced by the Ministry of Culture and National Heritage of the Republic of Poland.